Returning after a rather warm winter, the first thing I noticed on the Drag was the bright-colored sign advertising “Campus Candy.” What in the world could that place be? A candy store on the Drag, very convenient for hungry night owls? This place is going to do just fine. 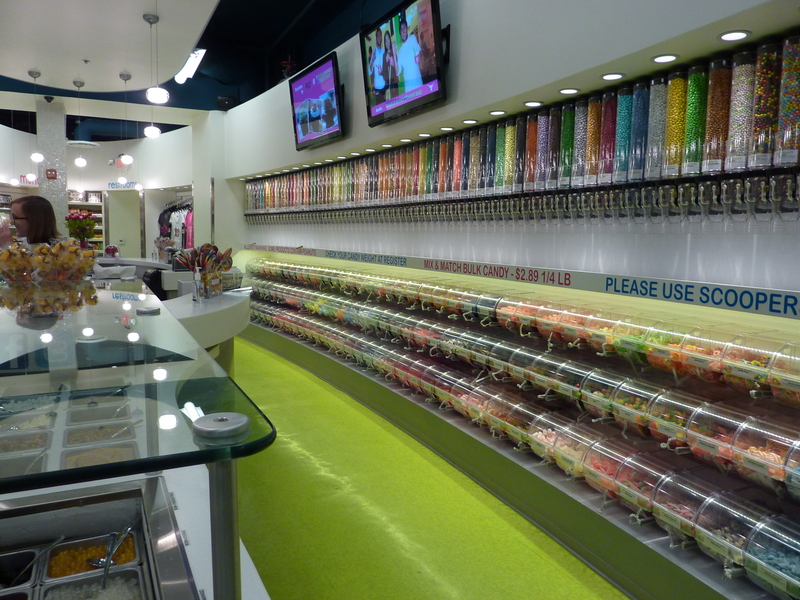 Campus Candy is the new kid on the block, replacing the previous clothing store Wish. It is a candy store that has opened up on the Drag that is covering some of the latest fads on campus. It sells frozen yogurt, pastries from Cheesecake Factory, and also popular drinks and snacks to pick up in between classes. You cannot miss this store on the Drag, blasting loud music like it’s a club and showing off its brightly-colored sign. Stepping in, it feels a bit like stepping into Wonka’s factory as the bright colors of the walls, seating, and candy overwhelm the visitor. 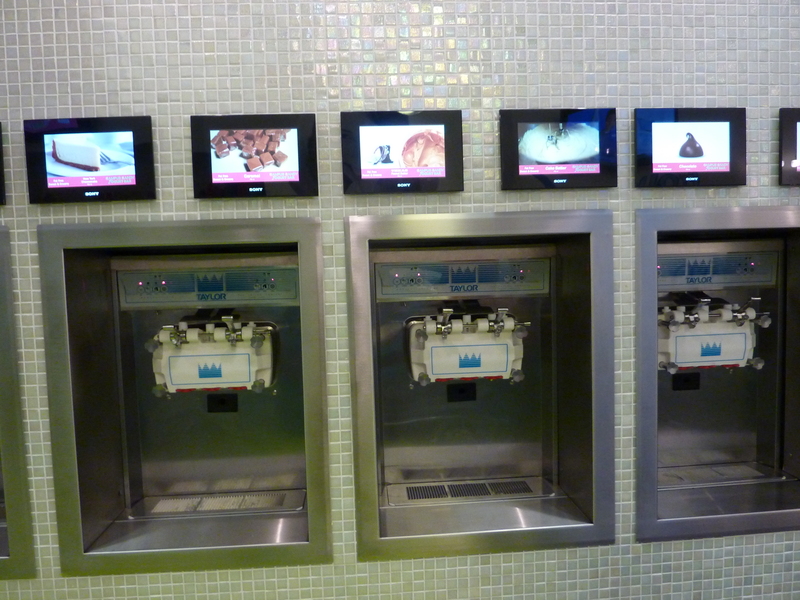 To the right is the frozen yogurt, supervised by an employee ready to explain the system and provide sample cups. A way to monitor the tasting of flavors, I suppose. The frozen yogurt is very flavorful and a wide variety. Flavors range from tiramisu to chocolate chip mint to raspberry. The price, however, is quite high. It is nearly 70 cents/oz. For a half full cup, it cost me about $3.30, a price that could get a lot more at the other frozen yogurt places near UT. 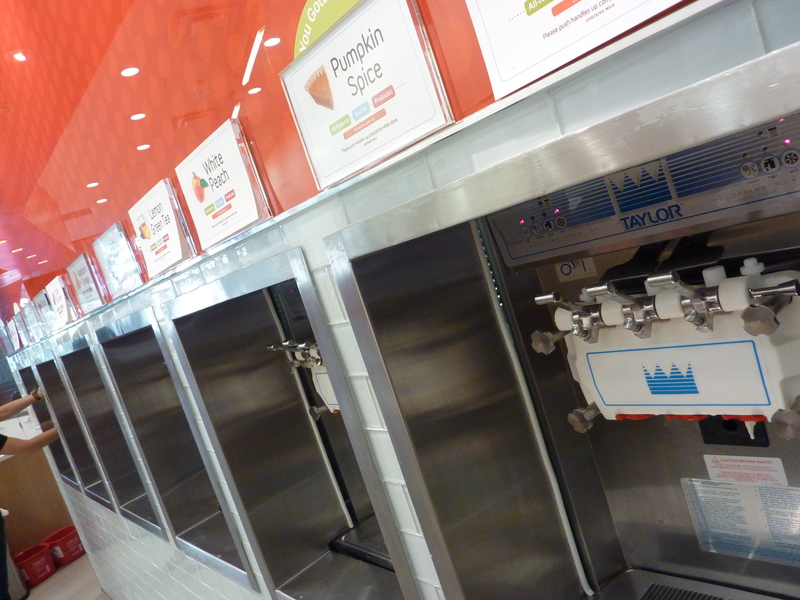 However, the flavors match Red Mango in intensity and the tiramisu and crème brulee flavors seem to be very popular. 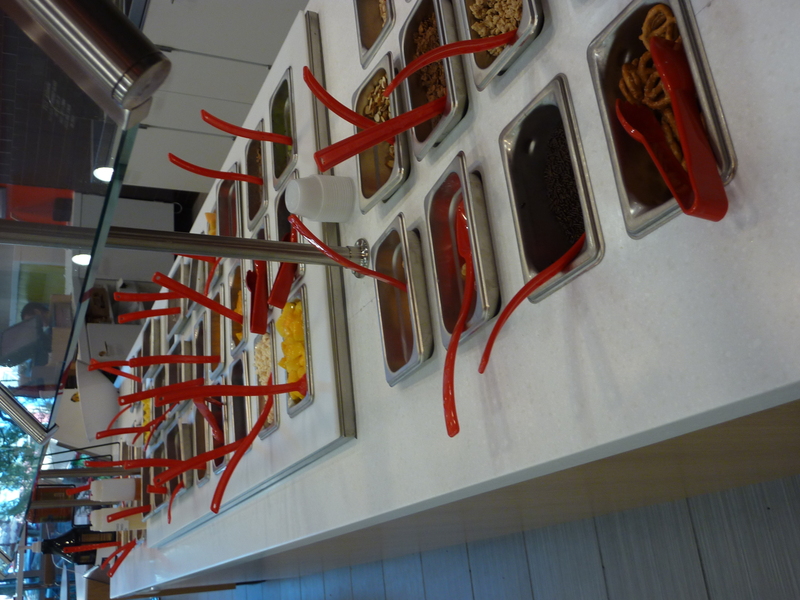 A variety of toppings are available at Campus Candy, just like you would find at any other frozen yogurt store. There are tons of sauces as you can see in the front of the picture and lots of fruits and chewy toppings like flavored mochis. I think I’ve also found a new favorite topping for frozen yogurt that tasted kind of like chocolate-covered rice krispy treats. 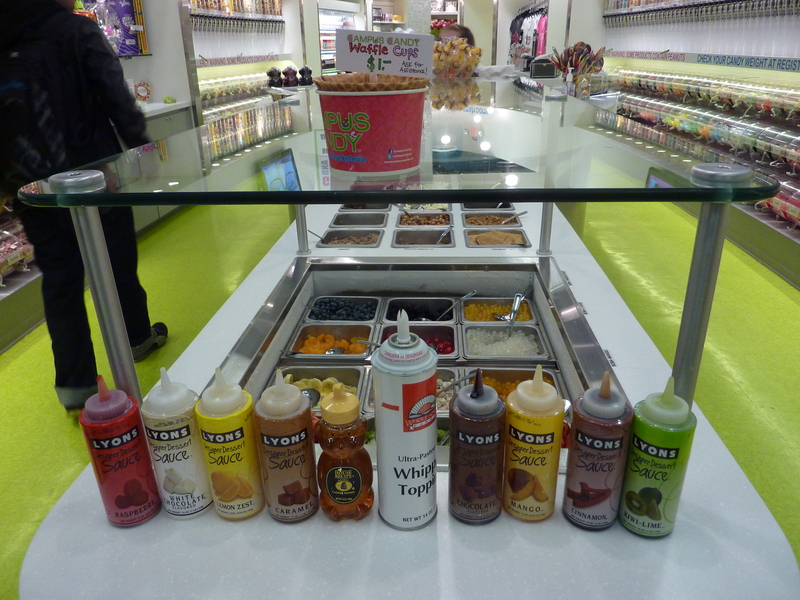 Tons of toppings and sauces, even some I have never seen at other yogurt places. Another fun addition to Campus Candy is the fact that you can put any candy in the store on top. It’s a great way to try out some new candies you want to check out, but don’t want to pay the $2.89/quarter of a pound for. For the yogurt I bought, I added some of the sour gummy bears on top to try them out. FYI, probably not a good idea to put gummies on top of cold products as it does reduce the chew of the candy. Some novelty candies sit around the store such as a 27 lb. gummy bear and the gummy skull next to it. When Valentine’s day was coming up, chocolate roses became available. A lot of old school candies are also available on the wall across from the register like Pot o’ Honey and Neccos. 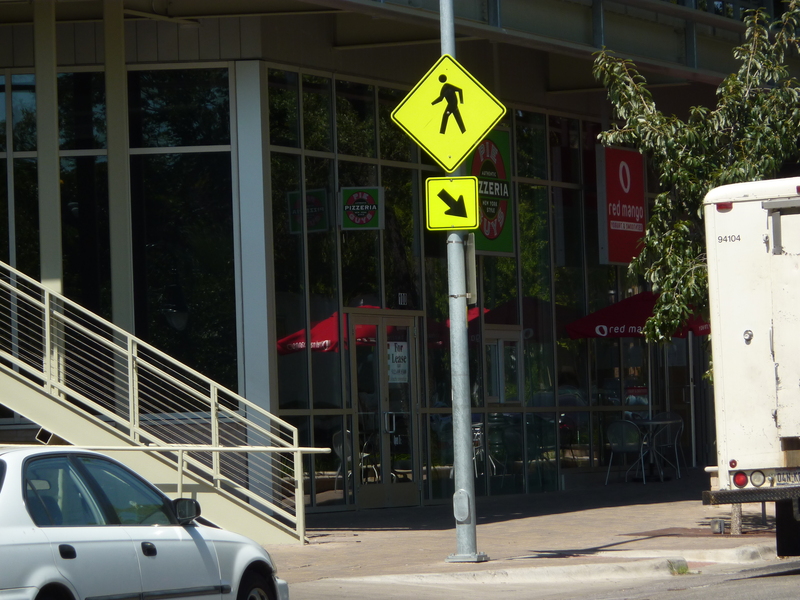 Ooh, Cheesecake Factory right next to UT! Finally, there are baked goods being sold at Campus Candy and finishes off the college student’s sweet tooth. 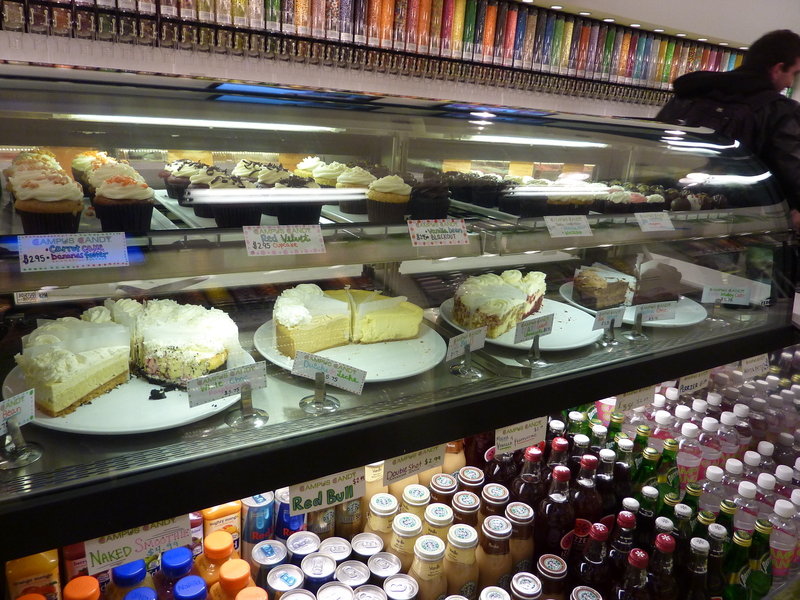 Most of the baked goods are from the Cheesecake Factory. These pastries include popular cheesecake flavors from Cheesecake Factory like Raspberry Swirl and Godiva Chocolate cheesecake. The cheesecake slices are not as big as the ones you get at the Cheesecake Factory, but they taste about as good as the ones you can get frozen at Sam’s. If you’re dying for a baked good, here is a decent place to go. They also have Cheesecake Factory’s cupcakes that I am interested in trying, but have yet to do so. Flavors seem to be rather standard such as red velvet, chocolate, and vanilla. Overall, Campus Candy seems like an establishment that will be very popular on the Drag and already it is attracting loads of customers each night. I am excited that more than frozen yogurt is being sold here and I love the variety and customization available for toppings. Also, there is finally a place on the Drag for easy access to baked goods other than cupcakes and cookies. Rating: 😛 😛 😛 😛 ½ for covering every sweet tooth, high prices, and good location. I saw you and knew I had to come. Walking around West Campus, I was minding my own business until I saw two girls walk by with huge Red Mango containers. What?! They’re open! To Red Mango we go! A very inviting place to enjoy some fro-yo. 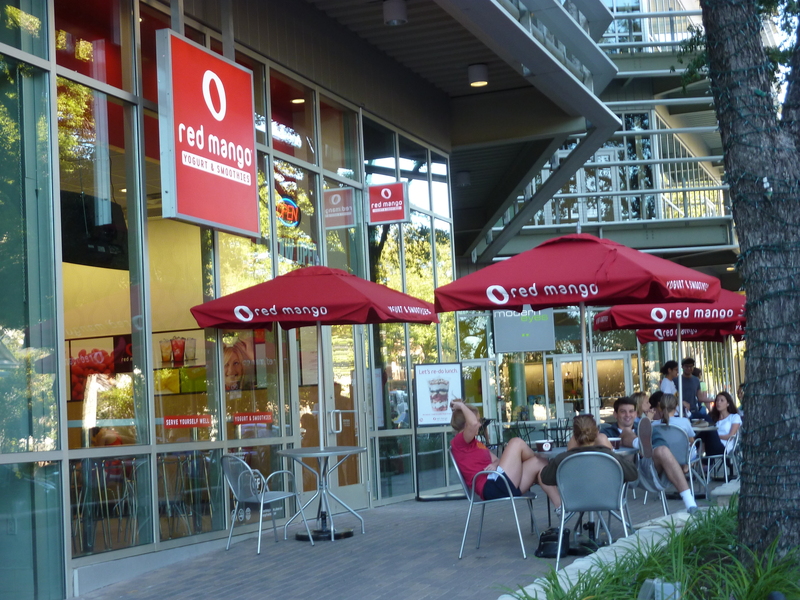 Red Mango is near to Plucker’s so it has a convenient central location, close to campus. The place is attractive with large windows and a streamlined interior that funnels customers to the back with the yogurt flavors. The distinctive red, white and brown design permeates the shop as big red umbrellas shade metal patio tables outside. Red Mango is clearly a casual place to hang out and enjoy some healthy yogurt with friends. Red Mango seems to be a place that usually serves yogurt creations, but is allowing for the trend of self-serve like other yogurt places in Austin. The employees were notably friendly and helpful in directing us through the process of buying yogurt (though it’s not like we haven’t done it before. :P) and were happy to tell us about Red Mango. There are also sample cups available that the employees encourage you to use. There is a good amount of unique flavors available and the machines seemed to work well and be clean. Parfaits and smoothies are available on the menu and most contain fresh fruit as a key component. They certainly looked delicious and the fruit looks fresh. Red Mango also conveniently provides calorie count and boosters. The raspberry, my standard for yogurt shops, was all right. Better than everybody but Juicytart, but not especially remarkable. I also just had to have the white peach and that was very tasty. I’d go back for that flavor alone. I then added some sliced almonds and chopped M&M’s for crunch. To top it all off, fresh mango and raspberries that were delicious. My friend also enjoyed her yogurt and she especially enjoyed the mandarin orange. The toppings were certainly plentiful, but the yogurt was the centerpiece. It’s good that Red Mango has yogurt tasty enough to stand on its own. Crunchy toppings, fruity toppings, chewy toppings, the works! The toppings bar was really nice. Tons of fresh fruit and lots of standard toppings like M&M’s (which are chopped up, a nice touch) as well as granola. Something a little different is liquid condiments such as sweet condensed milk and a variety of Ghirardelli sauces (though not a stranger to yogurt toppings). The fresh fruit bar really amazed me because the fruit looked nice and fresh and tasted delicious. I tried the mango and raspberries on top and they were definitely worth it. Coincidentally, my friend and I both hit 6 oz. and it’s about $0.39/oz. There is also a rewards card available called Club Mango. It’s nice if, like me, you go out for yogurt about every week. With 500 points, you get a $5 gift card and that’s about 2 yogurt servings for me. However, you only get 10 points/dollar so that will be about $50 later…yeah. Still, for your birthday, you get an automatic 500 points for your gift card so maybe it’s worth it for the birthday card? Red Mango does not currently take Bevo Bucks, but I’m sure it’s in the process of doing so. I will make an update if it does. It must be noted there is a little bit of an advantage to the shop because they have huge serving bowls that make you feel like you’re getting less than you usually do. That is the only real sticking point I have with the place. Otherwise, it’s quite big with a design style that’s reminiscent of Juice Box in Houston (if y’all know what I’m talking about) and lots of tables for enjoying food outside. The yogurt tastes authentic with its milkiness and sourness, but worry not lactose-intolerants! The presence of the bacteria will hopefully break down the lactose for you. 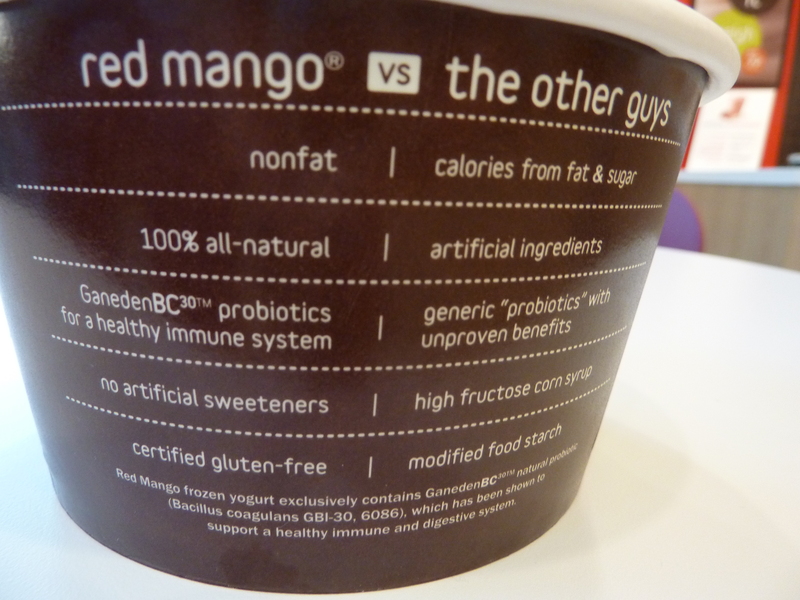 Red Mango also likes to let you know that they are gluten-free and kosher friendly. 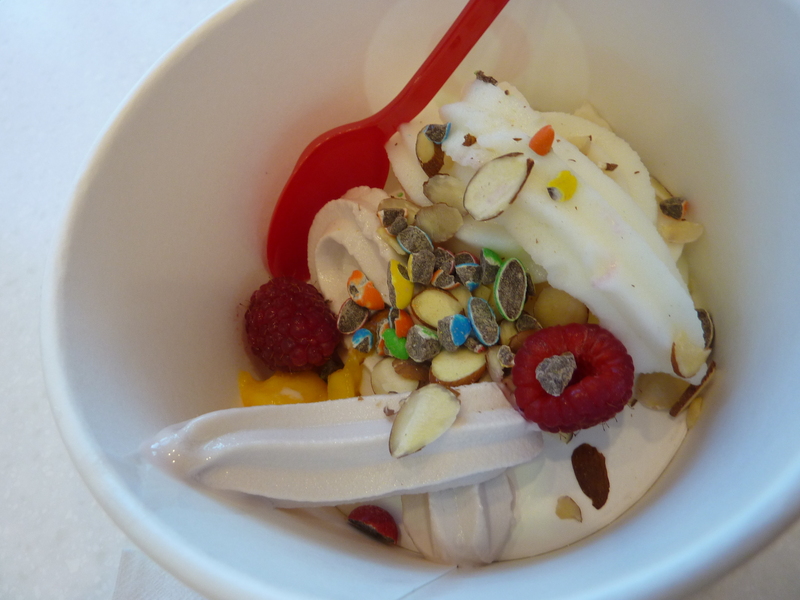 Red Mango is tasty, healthy, and close by, so what are you waiting for? Go out and try some yogurt! Rating: 😛 😛 😛 😛 because it’s tasty, fresh fruit, and lots of space. Definitely a place I’d go back to and it’ll be tough competition for other yogurt shops. P.S. 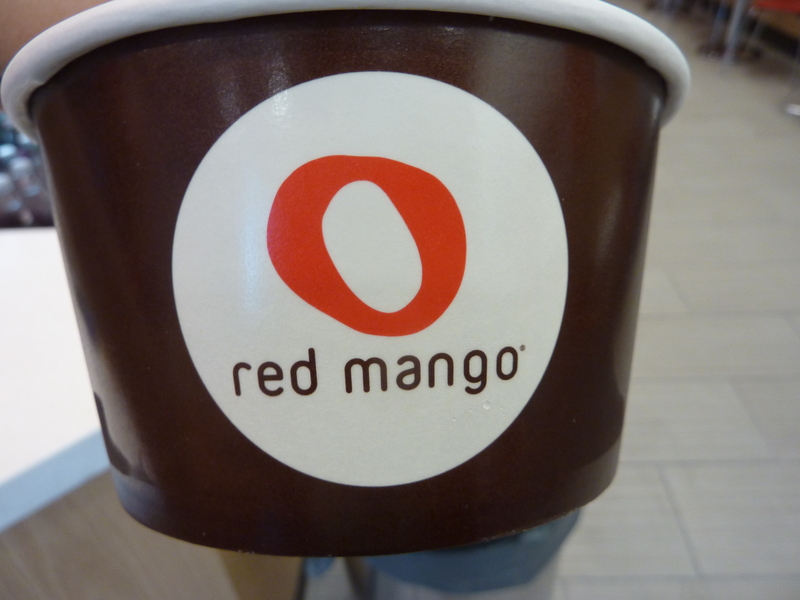 Check out my preview of Red Mango and hear about its history. PREVIEW: Red Mango. 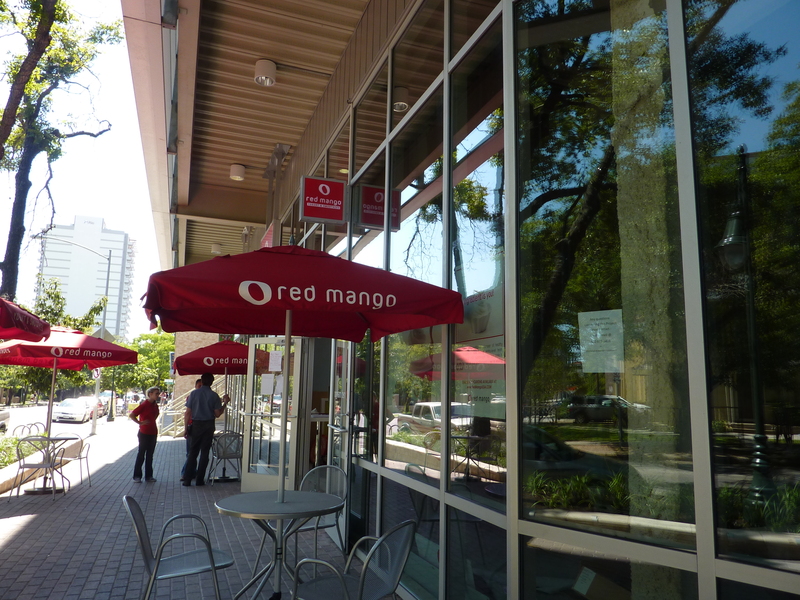 Update 10/17/10: Check out my review of Red Mango in Austin! 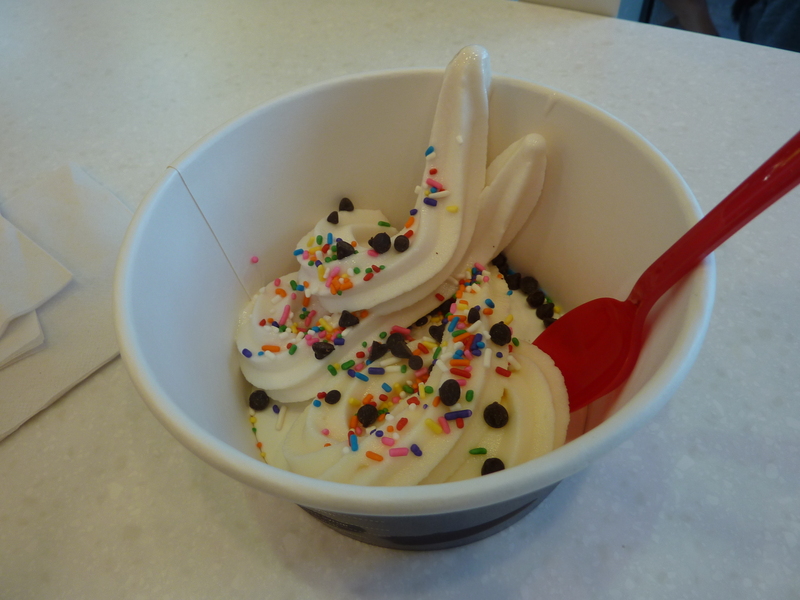 Yogurt Wars: Red Mango. Well, the game was not as happy as I was hoping it would be so the post I had made previously for it will not be quite right. However, that does not deter me from posting about food opportunities here at UT and I’ve got two. First off, I must explain how I stumbled upon the discovery of Red Mango, one of the first specialty frozen yogurt franchises that opened in the US. I was planning on creating a post about the trailer park square that is being created here near UT campus. It is called Longhorn Food Court and is definitely a place you should check out. Finally! That was a long walk. Longhorn Food Court is a recently renovated lot where Ivory Cleaners used to stand. 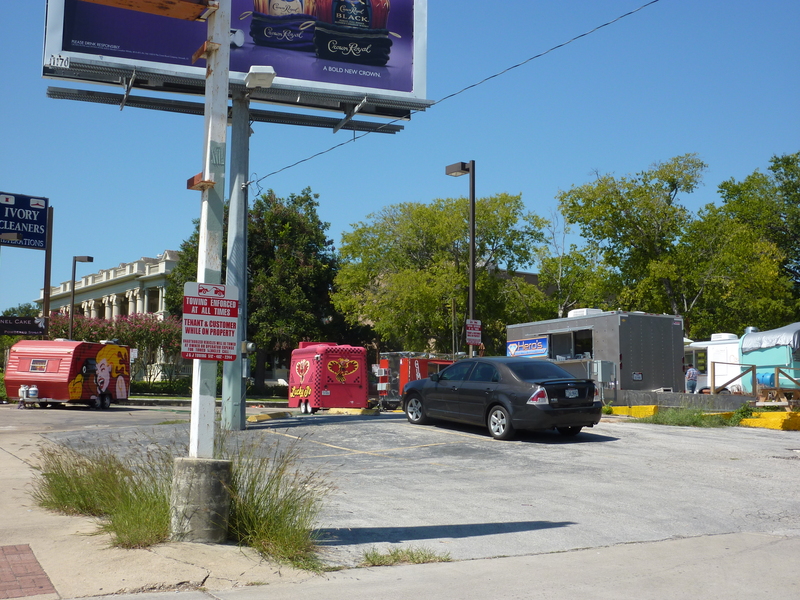 It is now a place for local food trailers around Austin to set up and serve their specialties in a convenient distance from campus. It is definitely a place you should try out if you are at all interested in trailer food and you just can’t make it to the other trailer carts around Austin. Mmm, I wanted to eat at Lucky J's, but they weren't open. Next time, definitely checking the website. Some of the trailer food you’ll find include Lucky J’s Chicken and Waffles, Elotes Locos, and Conscious Cravings. 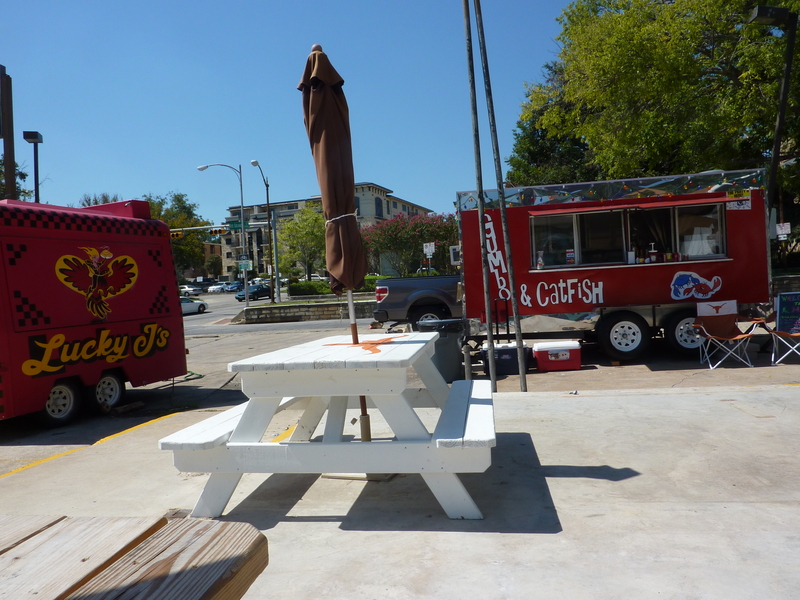 A really great site to learn more about local Austin trailer food is Austin Food Carts. I am afraid I did not try anything while I was there, so the review will have to wait, but the place is a nice place for trailers to set up and a few benches are available to sit down and start chomping down. On my way back to campus, I walked by Plucker’s and lo and behold, I saw a new frozen yogurt shop ready to open. What really made me not believe my eyes was that it was Red Mango, the first frozen yogurt shop I’ve ever heard of thanks to my roommate who has seen them in Chicago. As I passed by, they looked like they were still in the process of getting it together. However, it seems like it will be a done deal as you can find it as a future location on their website. It will apparently be self-serve, much like the other yogurt shops near campus. Can you see the construction? I am quite excited to try this place I’ve heard so much about. It is one of the earliest frozen yogurt shops, opening in 2002 and helped to introduce the frozen yogurt craze of fresh toppings and unique flavors. I will certainly be trying this place when it finally opens, but I think I still tip my loyalty to Juicytart.